As mentioned earlier, this book is a romantic, rather quick read. The plot is very simple and rather predictable, but the story is cute nonetheless, and I really enjoyed it. 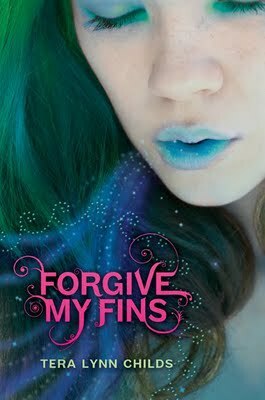 I actually find it refreshing to read a short, noncomplex book every now and then, and forgive My Fins was exactly what I needed! I have to admit that I really liked Quince (and not just because he is a biker boy, which is incredibly alluring ><). It was pretty obvious that he is one of those guys who loves to annoy and make fun of the girl he likes in order to get their attention. (Oh, boys and their ways. Do they ever grow up? XD) I felt bad for him in the beginning, since his feelings for Lily were fairly blatant and she hardly looked his way. Even though he likes to irritate her, he really cares for Lily and just wants to see her happy, and I really like that about him. I also liked Lily’s character. She is strong and resilient, and I love how she is willing to stand up for herself and those she loves. There were times when I got frustrated with her brooding for Brody and blaming her developing feelings for Quince on the inadvertent ‘bond’ that formed between them. (In my opinion, Lily blamed the ‘bond’ for her feelings a little too much, and it got to be slightly annoying.) However, I understood her concerns about the bond and Quince. She always thought she hated Quince and vice versa since he seems to get lots of pleasure from making her angry, so when she starts feeling drawn towards him, she is left pretty confused. But to be honest, I think their slow developing love is the best aspect of their relationship. Lily has known Quince for years and she has never been attracted to him. But as she starts to learn more about him, she finds herself slowly falling for him. It is not instant attraction, which is very common in most YA books today, but rather an attraction that slowly develops over time as they discover more about one another. It makes their relationship and feelings for one another seem more real, and I really respect Childs for that.